Organic and Nature's Window & Glass Cleaner is safe for your family, baby and your home environment. Works great on windows, mirrors, and glass, leaving them streak-free and delightfully fragrant. 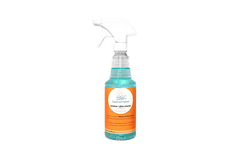 This natural, non-toxic product was formulated with natural cleaning agents to avoid the use of harsh chemicals, and contains a light citrus lemon fragrance. This product contains no ammonia, phosphates, or Volatile Organic Compounds (VOC's) present in other conventional cleaning products, which may be harmful to people and the environment. Ingredients: Plant-based surfactants, natural spring water, organic lemon oil and organic vinegar.